Educational Institutions: Cornell College is a private undergraduate liberal arts college with approximately 1,100 students. 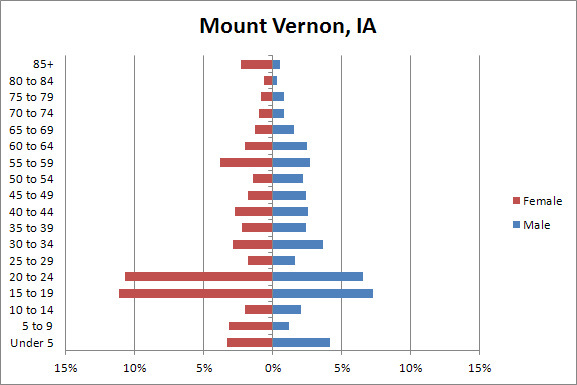 Mount Vernon has some pronounced demographic trends due to its small size. The population of the city is predominantly white and there is a large proportion of people aged 15 to 24, presumably because of the impact of Cornell College; the second largest demographic is people in their late 50s. 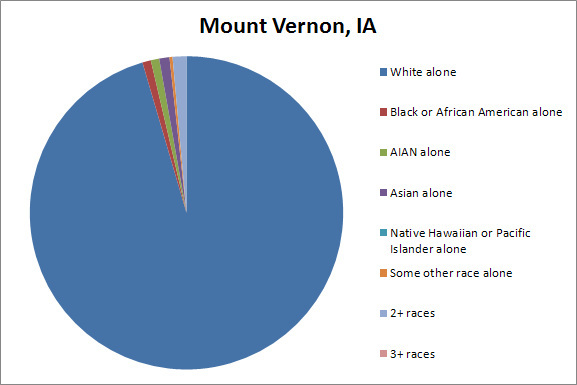 Mount Vernon is an affluent community with many households making more than $60,000 per year. Small size: Mount Vernon is a small community and many of its residents walk or bike to their destination unless they are traveling to a nearby community (Jennison, 2011). Community Development Group: Mount Vernon has an extremely capable community development group that coordinates community events, advertises the community and supports businesses. The group, the Mount Vernon-Lisbon Community Development Group (MVL-CDG) is funded primarily through the city on an annual budget of approximately $45,000 plus approximately $35,000 in annual private investment. The 2009-2010 Annual Report indicates that the CDG has already secured more than $5 million in investments and harnessed nearly 3,500 volunteer hours during a one year period (MVL-CDG, 2010). 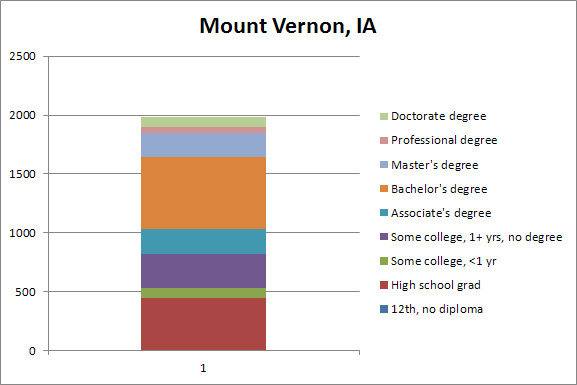 Volunteer labor force: Joe Jennison, Executive Director of the MVL-CDG, estimates the volunteer labor force he oversees to be around 350 people (Jennison, 2011). The community regularly advertises for volunteers for committees and events through its blog and has a volunteer portal where people can sign up to put their skills to use. Cornell College students are actively engaged in fundraising and staffing downtown events in all seasons. Arts and culture: Mount Vernon exemplifies a community that is focused on art, artists and one-of-a-kind products. The community has several resident artists and it has generated a niche market for antiques and vintage goods. This summer, the 4th of July Antiques Extravaganza attracted 10,000 visitors to Mount Vernon, more than doubling the native population of the city (City Council of Mount Vernon, Iowa, 2011). As a certified local government (CLG), Mount Vernon has also established a historic preservation commission that oversees design guidelines and changes to existing historic structures. Streetscaping: Mount Vernon takes a public-private collaborative approach to streetscape beautification in the downtown. In 2010, Mount Vernon commissioned the Iowa firm Shoemaker-Haaland for an improved streetscape design (Shoemaker-Haaland, 2010). Shoemaker-Haaland conducted three public workshops and made public presentations to residents and the City Council regarding its design concepts for the downtown. The design fee of $45,000 was shared jointly by the City of Mount Vernon, which paid $25,000 (financed through TIF funds) and the MVL-CDG, which paid the remaining $20,000 (Krob, 2010). The design incorporates more than $2.1 million in improved streetscape designs that are intended to be implemented incrementally. However, according to Ed Sauter, President of the MVL-CDG, “The design is such that it can be implemented incrementally, but it's important to have the entire plan ready to go if funding should become available” (Krob, 2010). Within the private sphere, Mount Vernon also established an annual 50/50 matching Business Improvement Grant (BIG) which offers businesses funding in specific categories, such as awnings, façade lighting or hanging signage (Jennison, 2011). These categories rotate on an annual basis, allowing the city to focus on specific exterior building elements that can enhance the appearance of the downtown while leveraging private investment. The city employs a scoring matrix, administered by the MVL-CDG Design Committee, to determine which projects will produce a maximum benefit (see Appendix H for the example scoring matrix). Lincoln Highway initiatives: Mount Vernon is part of the Iowa Chapter of the Lincoln Highway Association, which sponsors advertising and networking for communities along the Lincoln Highway in multiple states. 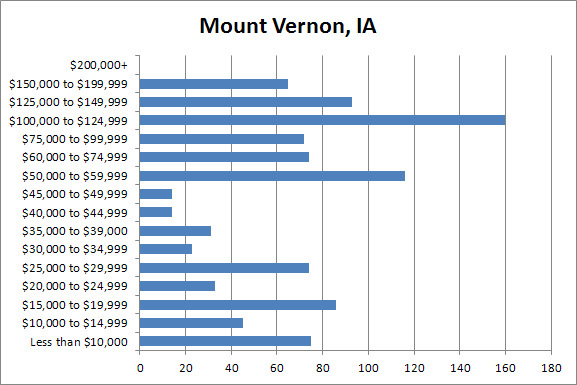 Several of the annual events for Mount Vernon are part of this network, which has put Mount Vernon on the map as a regional destination (Lincoln Highway Association, 2011). Technical business assistance: Mount Vernon provides local businesses with many valuable resources. There are business networking events approximately 6 times per year which allow business owners to meet and mingle. Additionally, the city has put on workshops on topics such as how to build a website, website optimization, statistics and market data, historic preservation initiatives, social media and upper floor renovation. These events have been led by a mixture of professionals, high school students, Cornell College students or professional organizations such as the Illinois Historic Preservation Association. The CDG has also has hired surveyors in the past to attend local events and discover who travels to Mount Vernon and how much money they spend while in town. This information is then communicated to business owners to show them their strongest market segments and help them better reach their customers (Jennison, 2011). Downtown Residential: Mount Vernon successfully targets college students from Cornell College to live in the second-story apartments of its downtown and has been very successful – 26 residential units now exist downtown. Eight of these unites were renovated since 2008 and there is a wait-list for occupancy in the downtown (Jennison, 2011).